We are thrilled to announce the 17 writers, directors and producers selected for NETWORK@LFF 2017. Participants for our professional development programme which takes place annually at the BFI London Film Festival (LFF) on 4-9 October 2017. Designed to support and inspire original new voices in film, NETWORK@LFF celebrates diversity in approach and perspective, and seeks out filmmakers looking to disrupt conventions. 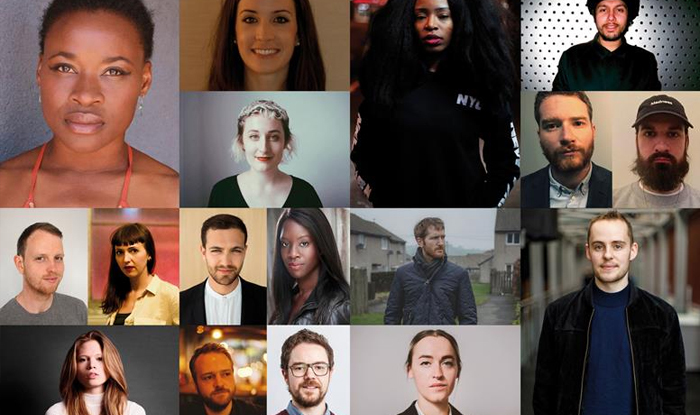 Supported with National Lottery funding, NETWORK@LFF is now in its fourth year and has built a strong track record with alumni successfully establishing careers, producing award-winning shorts, developing features and finding roles within television and beyond. There are eight films premiering in this year’s LFF by filmmakers supported through the BFI NETWORK. From NETWORK alumni, Kingdom of Us directed by Lucy Cohen is screening in Documentary Competition and I Am Not a Witch directed by Rungano Nyoni is shortlisted for First Feature Competition, plus shorts Robot and Scarecrow directed by Kibwe Tavares and Victoria Sin directed by Amrou Al-Kadhi. As well as BFI NETWORK funded shorts 1745 directed by Gordon Napier, Real God’s Require Blood directed by Moin Hussain, The Full Story directed by Daisy Jacobs and Wren Boys directed by Harry Lighton. Adura is a Glasgow-based writer and director. She has premiered two productions, HeLa and Expensive S**t, at The Edinburgh Fringe festival, winning a Fringe First and TOTAL and Amnesty nominations. Both shows toured nationally and internationally supported by British Council and Creative Scotland. She currently has a feature film, Girl, in development with Glasgow producers (and BFI Vision Award recipients) Barry Crerar, and has recently been awarded development support from the Scottish Film Talent Network (SFTN). Harry is a London-based writer/director. His short, Sunday Morning Coming Down, has screened at festivals including BFI Flare: London LGBT Film Festival and was nominated for Best British short at the 2017 Iris Prize. His next short, Wren Boys, was funded through Film London's London Calling scheme and is nominated for the Short Film Award at this year's LFF. Harry recently wrapped Leash, funded through Enter the Pitch and is currently developing several feature projects. Irune’s debut feature, Pikadero, screened at over 40 international festivals following its premiere at the San Sebastian International Film Festival. It won various awards, including a FIPRESCI and the Michael Powell Award at the Edinburgh International Film Festival. Pikadero has been theatrically released in a number of European countries. Gurtubai has recently worked at London-based production company Altitude Film Entertainment in development and acquisitions. Prior to that, she produced short films including Patata Tortilla, which won two BAFTA New Talent Awards. She has also worked as a line producer and script developer. Jenn is an artist and an MFA graduate of Howard University. Her first film, En Vogue, shot by Bradford Young & Arthur Jafa, screened internationally to critical success. Recent credits include a documentary series on music subcultures, a campaign with photographer Rankin where he selected Nkiru as one of 20 of the "industry's top directors and most creative talent" and a forthcoming short film for NOWNESS. Nkiru has previously been long listed for the Brilliant Filmmaker 1.4 Award, Aesthetica Art Prize and was a winner at the of the 2016 Encounters Film Festival. Julia is a London-based director from Belfast, Northern Ireland, working across film and audio-visual installations. Their works stem from personal experience and involves deconstructing traditional patriarchal narrative structures and sensory experiences. Blurring the lines between documentary and fiction, their work is highly emotional and politically charged. Mark is a filmmaker and artist based in Newcastle upon Tyne. His moving-image work has been selected for numerous festivals including the Edinburgh International Film Festival, Clermont-Ferrand International Short Film Festival, IKFF Hamburg, São Paulo International Short Film Festival and Encounters. Previously, he was selected for the Berlinale Talent Campus at the Berlin International Film Festival. Mark also teaches film production at Northumbria University. After being selected by the Directors Guild of Great Britain to take part in a scheme for new talent, Moin’s first short film, Holy Thursday, was funded by Creative England and went on to screen internationally. His latest short, Real Gods Require Blood, premiered in this year’s Critics’ Week at Cannes, with other presentations at the Sitges Film Festival and the Edinburgh International Film Festival. It is nominated for the Short Film Award at this year's LFF. Morayo began her career as an actor, before transitioning to writing. Her debut short film, 1745 – in which she also starred – was funded by the Scottish Film Talent Network via Creative Scotland and BFI NETWORK. Longlisted for the Sky Arts Academy Award 2016, receiving a Jury Special Mention at the Edinburgh International Film Festival 2017, and screening in this year's LFF, 1745 is now being developed into a feature supported by Creative Scotland. Akandé is also working on another short, which she will direct as a lead up to making her first feature, the psychological thriller Amity. Omar is a former Leverhulme Associate Playwright at the Bush Theatre. His plays include Burst, Sour Lips, The Keepers of Infinite Space, The Chaplain and Homegrown. His first short film, No Exit, received its world premiere at the Dubai International Film Festival 2014 and screened internationally. His documentary, Naz, is currently in development with Postcode Films and Hakawati. He is developing television projects with Studio Lambert and Dancing Ledge Productions, and he has started work on a feature-length screenplay. Patrick co-founded production company Nakba FilmWorks with writer/director Mahdi Fleifel in 2010. Since then he has produced the award-winning feature doc A World Not Ours and the 2016 Berlin Silver Bear-winner A Man Returned, as well as The Welfare of Tomás Ó Hallissy (Berlin International Film Festival 2017) and A Drowning Man (Official Competition, Cannes), a short fiction piece from Fleifel. He is currently developing fiction and documentary features in the UK and Ireland. Prano is an award-winning writer/director. She has made a number of short films, including the horror-thriller Nasty, which has collected awards globally, screening at over 100 festivals. She recently worked with Film4 on Shortcut, made as part of their Fright Bites short film series for All4. Prano is currently developing two features with Silver Salt Films – Censor, in development with Ffilm Cymru Wales and Creative England, and Womb, which was selected for the Ffilm Cymru Wales ‘Cinematic’ development scheme. Rory is an animator and filmmaker from London. He graduated from the Royal College of Art in 2015, and his graduation film, Mr Madila, has played at international film festivals including Flickerfest, Premier Plans, Palm Springs and Fantoche, winning more than ten awards. He is represented for commercial animation by Beakus, and is interested in using animation to interpret reality, playing with the line between the mundane and the fantastical for comedic effect. Ruth is an award-winning Scottish writer/director with a strong body of short drama, experimental and music-related films. She isworking across a number of projects including feature horror Fifteen Wolves in development with BFI Vision Award recipients Barry Crerar, and its sister short Be Still My Beating Heart, recently commissioned for production via the Scottish Film Talent Network, shooting in winter. Ruth is represented by Casarotto Ramsay & Associates. Sarah is a producer and director. She is co-director of award winning interactive theatre company non zero one, whose work includes Let's Take a Walk (Barbican Centre), You'll See Me [Sailing in Antarctica] (National Theatre) and Mountaineering (Roundhouse). Her first short film, Exit Route, was selected for the LOCO London Comedy film Festival in 2017. She is currently developing two feature films, Helter Skelter written by Tom Weston Jones and The Queen of the Isle of Wight written by Barney Norris. Sean is a writer/director whose films have played at film festivals such as Locarno, Sundance, New Orleans and the Chicago International Film Festival. He is interested in telling stories which have a universal reach and relevance, but which are grounded in Scotland and the wider UK. A graduate of Columbia University in New York, Sean specialised in screenwriting and directing, and is currently developing his first feature. Having originally been drawn to film by his love of animation and drawing, Simon has worked with many different techniques. His short film, Manoman, premiered at Cannes and went on to screen at a number of festivals including Sundance and SXSW as well as being nominated for the Best Short Animation BAFTA and the BIFA for Best British Short. He is currently working on a live action short funded by Creative England. Trim is a British Indian filmmaker from London. His Snapchat-based drama short Cracked Screen, celebrated as ‘groundbreaking’ and ‘the new era of filmmaking’, received several honours and screened at Cannes Lions as part of the 27th Saatchi and Saatchi New Directors Showcase. Lamba recently completed his Masters from the University of Oxford and is currently developing a drama series and two shorts that will carve out new modes of storytelling.